I can't believe that half of June is over. It's going by so quickly. I hope time slows down a bit once school is over. There's nothing better than being a kid and having your entire summer vacation ahead of you. I really wanted to take this week off from meal planning, but having a meal plan in place on a Monday makes the week run more smoothly. And since this is the last week of school, I'll take all the help I can get. Sunday - Hubs in in charge which means something on the grill! What's on your plate this week? 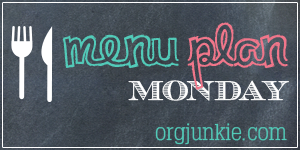 For more meal planning inspiration, be sure to visit I'm an Organizing Junkie's Menu Plan Monday. To view all of my menu planning post, click here.